Frazier Campbell’s second half brace led Cardiff City past Premier League contenders Manchester City, in their first top-flight home match in 51 years. The victory also handed Manuel Pellegrini his first Premier League loss, in a match that escaped his men. City stuck with the same lineup that easily dispatched of Newcastle in their home opener, with only Javi Garcia replacing the injured Vincent Kompany. But it was a special day for Cardiff supporters, and Malky Mackay’s men gave them every reason to celebrate. The Bluebirds produced an inspiring performance, tactically masterminded by Mackay, and the Cardiff manager was radiant in his post-match press conference. “I thought tactically the players out there did an incredible job today and deservedly won the game,” Mackay said. “We were playing against top, top players. I’ve spoken to the boys about how proud they should be because they deserve to be here and they deserve to be out there playing against these top players and it is about belief and believing in your own ability,” he added. The Bluebirds frustrated City in the opening 45 minutes, with Craig Bellamy and Peter Whittingham tracking back to protect their fullbacks, along with Gary Medel and Aron Gunnarsson breaking up play in the middle of the park. 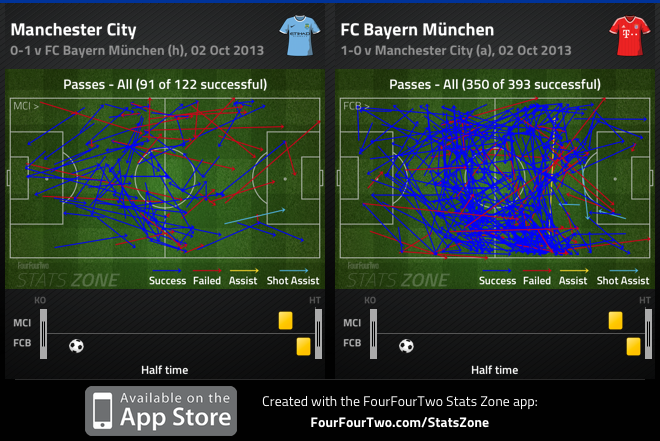 Although City maintained balance, the difference in their performance was the lack of partnerships and fluidity. Navas was City’s most influential player in the first half – the Spaniard found pockets of space to receive the ball on the right, allowing Zabaleta to push forward, while he supplied a few quality balls from wide areas. On the other wing, Silva was constantly weaving from flank to flank, trying to find openings and link play, but the quality in the Spaniards play was surprisingly poor. 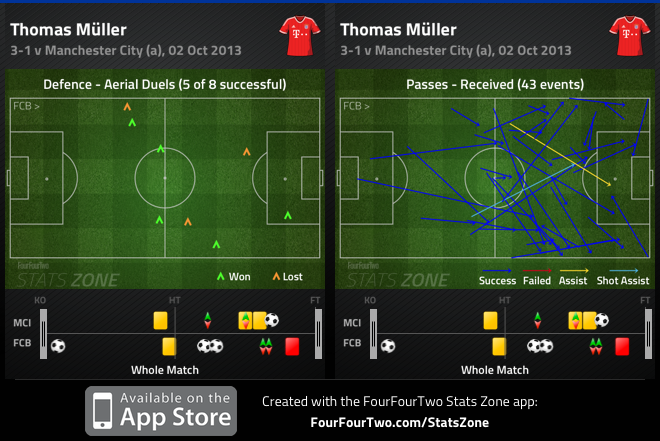 Gunnarsson, Campbell and Kim Bo-Kyung also played a pivotal role in nullifying City. 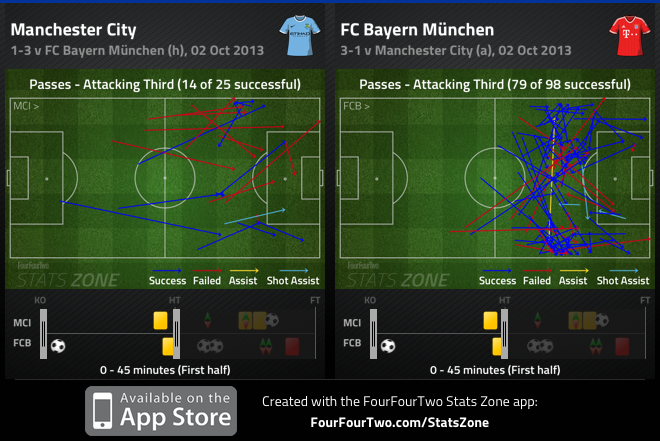 Cardiff dropped into two banks of four without the ball, with the latter taking turns pressing Yaya Toure and Fernandinho, thus preventing them from playing positive forward passes. City’s midfield duo was restricted to playing sideways passes, and attempting long balls, as the pressure applied by Mackay’s men constantly disrupted City’s attack. It took Pellegrini’s men 30 minutes to create a chance, from a Sergio Aguero cross, which resulted in a tame header from Dzeko. But it was Cardiff that received the best chance of the half, when Campbell pounced on Javi Garcia’s mistake, which forced Joe Hart into making a top save to keep the score leveled going into the half. City continued to impose their superiority on the match in the second half, as Mackay’s men slowly began to focus on their shape, opposed to pressing Yaya Toure and Fernandinho. City took advantage of the fatigued Bluebirds, when Toure was allowed to play a penetrating pass to Aguero, who flicked the ball to Dzeko. Dzeko was allowed ample time to strike a venomous shot from 25-yards past David Marshall. 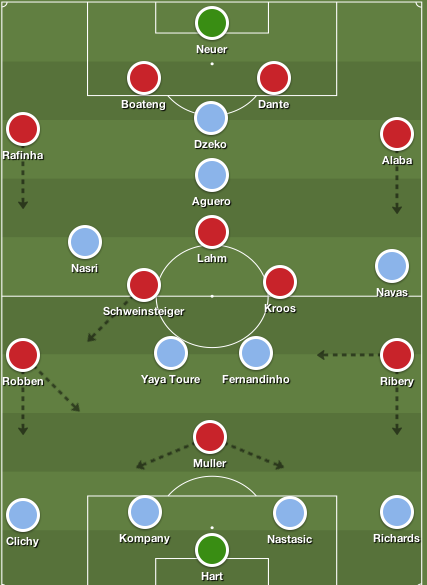 At this point it looked inevitable that City would run riot – Aguero was continuously receiving the balls between the lines, Toure and Fernandinho were finally playing penetrating passes from deep, and Silva was getting more touches on the ball. But City lost an important element going forward when Nasri replaced Navas, who appeared to pick up a knock. City’s attack became extremely narrow, and Mackay’s men stayed compact and organized, comfortably coping with City’s movement in the final third. Five minutes after the substitution Cardiff equalized – Kim did well to skip past Gael Clichy, playing a devastating ball to Campbell. The Bluebirds striker directed the ball on net, thus forcing Hart into a good save, but Gunnarsson followed up on the rebound, thumping his shot into the net. Pellegrini responded positively to the minor set back, introducing Alvaro Negredo for the uninspiring Dzeko, and James Milner for Fernandinho, but neither player had an instant impact on the match. However, in the 79th minute, Whittingham delivered a sensational corner kick, which the unmarked Campbell met at the far-post, and nodded into the net. Hart’s positioning was putrid, but Pablo Zabaleta allowed the Cardiff striker to attack the ball freely in the box. Eight minutes later, Campbell added to his tally from another corner kick, as once again, Zabaleta allowed him to nod the ball past Hart. Substitute, Negredo, pegged a goal back for Pellegrini’s men in injury time with a lovely header, but it wasn’t enough to earn a point in Wales. City’s second half collapse was reminiscent of away defeats City suffered under Mancini, but Pellegrini feels his side played well, despite losing in such a devastating manner. “I think we played against a very difficult team – Cardiff had ten players near their own box it was very difficult for us to try and score but when we scored the first goal I thought we played a bit better after that,” Pellegrini said. “Of course nobody can believe they can score two goals against us in set-pieces, but football is like that. You must be concentrating those kind of places and I think Cardiff won the match, but I think we played better,” he added. Pellegrini’s men grew in the second half, and although a few defensive mishaps benefitted the home side, their lack of production in front of goal, merited dropped points. City’s loss means they remain winless on their travels to Wales, yet that shouldn’t overshadow the performances of some of their top players. It’s time the likes of Yaya Toure, Silva, Nasri and even Aguero be held accountable for City’s away woes, and it’ll be interesting to see whether they mature mentally during Pellegrini’s tenure. Nevertheless, it was a fantastic performance from Mackay’s men – the Bluebirds showed resilience, grit, tactical discipline and belief to claim all three points against a strong Manchester City side. Campbell’s workload on the defensive end to keep City’s midfield duo quiet, was impressive, and he was involved in every Cardiff goal. Gunnarsson and Medel were also exceptional in midfield, pressing City’s key men, breaking up play in midfield and playing positive passes forward. Overall it was a well-deserved victory for the Bluebirds and a fitting afternoon for a club that’s waited 51 years to see their club return to the top flight.